The essence of a medical device is its relationship to the patient. A growing trend in preventative health is wearable technology, like smart watches and monitors placed on the skin. The engineers of these devices must find solutions to make medical technology flexible and durable enough to work on a person’s wrist or hip for example. Michael Garry, AMADA MIYACHI EUROPE explains. Under-the-skin devices like replacement heart valves or neurological implants, on the other hand, receive Class III designation, meaning they are determined to be high-risk as part of the CE marking process. These devices - usually tasked with supporting or sustaining human life - both offer more and pose a greater threat to patients. Patients could be harmed by a device failure, or from incidental harm. A patient might lose his or her life if an implantable device, for example, malfunctions. At the same time, if materials inside the device penetrate into the body, they could cause infection. Among other traits, these devices require 100% hermeticity and joint integrity. Of course, the quality of a device is subject to a variety of factors, from its materials and design to the reliability of its manufacturing process. Realistically, it also depends on cost. For engineers working to enable quality care by manufacturing top quality devices, the manufacturing process must produce consistent quality at the most time- and cost-effective rate available. For both Class III device manufacturing and the development of wearables, incorporating the right welding and bonding technology can facilitate high quality products whilst safeguarding patients’ wellbeing and protecting the manufacturers’ bottom line. Take the task of seam welding, an important step to ensure hermeticity and device lifetime for such critical devices as pacemakers. Device manufacturers have no shortage of options. Plasma welding is often used and works relatively well. Electron beam welding is another clean process which yields relatively good results. However, each of these processes can consume time at needless rates. They also require highly complex systems with components like vacuum chambers. The more elements of a process involved, the more opportunities for minute inexactitudes to affect quality. Even if slight inconsistencies are spotted and remedied in a factory before being introduced into medical care, deficiencies can cause the waste of material and time. Laser welding generally provides an equal or greater accuracy to these legacy processes, and offers important advantages to manufacturers. First, no time consuming, vacuum chamber or the like is involved. Laser welding can be done in an inert gas atmosphere, generally nitrogen-based, as in Amada Miyachi Glovebox systems. Importantly, laser welding is usually quicker than its counterparts and creates very reliable joints. Generally, medical device manufacturers now opt for automated laser welding as a way of driving costs down and improving welding process control. Advanced laser welding systems benefit from features like vision systems, which enhance automation capabilities on machines by interacting with the specific parts being welded. Vision systems use cameras to recognise parts, identify the weld areas, and locate the optimal position for the laser to begin joining parts. This can save significant resources. Many pacemaker parts are pressed, not machined, so the location of the interface varies. Manual alignment can take several minutes for each device. Vision systems and bespoke software algorithms on Amada Miyachi Europe Laser Welding Systems cut the task down to a few seconds. Another major advantage of using a laser is its flexibility. A prime example comes from the production of hypotubes. The process requires micromachining features into a tube, also known as a catheter tip. The tip is then welded to another wire or tube which is known as the hub. With an Amada Miyachi Laser Welding System, laser machines can both cut and weld the metal. In fact, stand alone systems can perform marking and ablation of coatings, too. In addition to welding together parts of pacemakers and hypotubes, laser welding systems are effective at welding certain types of stents, drug pumps, implantable valves, and other life-supporting devices. It is not, however, necessary to use laser welding, as a process for every invasive device, or even for every joint that goes to make up that device. To weld the batteries inside pacemakers for example, resistance welding is commonly employed. The most central way in which this process differs from laser welding is the relationship between the machine and the device being manufactured. In resistance welding, the welder comes into contact with the parts which are being welded together and applies pressure and an electrical current at that point. In laser welding, only the laser beam touches the area of the weld. In the wearables market, however, the goal of joining parts together is not necessarily to be seamless. Nonetheless, the reality of the human body and its interface with a device still poses a central challenge to manufacturers. A major question is how to integrate high technology - with its metalised circuitry - into items which flex with the patient’s form. Here, the relevant technology employed is in some ways similar to resistance welding. Hot bar bonding uses a thermode (or Hot Bar) to create an electrical interconnection between materials under a controlled pressure. The small, flexible characteristics patients expect from wearables can be achieved by forcing layers of material together in this way, like gold to monitor heartrate from contact with the skin and minute, flexible batteries to power whatever function a device performs. Not all of the elements bonded into wearables are forced to melt and reform. Anisotropic Conductive Film, or ACF, is a laminating or pre-bonding layer used when a fine-pitch is required and where selective reflow soldering cannot be applied. 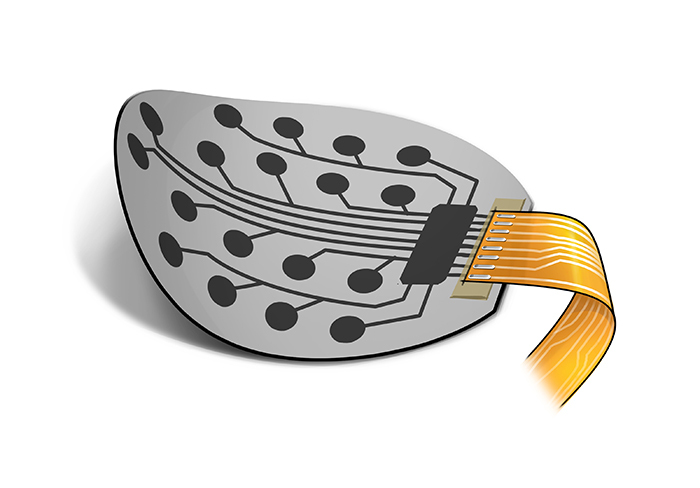 This facilitates interconnection between flexible circuit boards and displays, for example. The ACF material consists of adhesive filled with conductive particles and a protective layer. With newhorizon Hot Bar Desktop Series Systems, the ACF is positioned over the bond surface, and the ACF laminating is achieved by applying temperature and pressure. Once ACF laminating is completed and the flex has been aligned to match the traces on the substrate, the thermode (Hot bar) is again actuated to heat the parts to final bonding temperature under controlled pressure for the final bonding step. ACF bonding is one of several Hot Bar techniques. Others include Hot Bar reflow soldering, in which two parts are coated with solder before the solder is melted to connect the parts - and heat staking, a pulsed heat process to join a plastic part with another part made of plastic or another material to form a rivetted type of joint. Of course, every application of these technologies requires careful engineering. It is best to confer with experts when developing product manufacturing programmes which integrate advanced welding or bonding techniques. If a customer who wants to develop a medical device takes their product to an automation company that can manipulate the parts and get them in the right position, they may not have the in-depth process knowledge that Amada Miyachi Europe has in house. Incorrect integration of laser welders may cause damage to the system. This may be easily avoided when working with suppliers that possess the necessary expert design and application knowledge. Furthermore, it is not always immediately clear which technology would best serve a medical device’s welding challenges, as the joint configuration is the key to choosing the correct welding process. For this reason, it is paramount that manufacturers consult welding or bonding expertise and undertake a diligent design process. Amada Miyachi Europe facilitates both of these goals. Their bespoke process begins with a consultation with a new client to understand the requirements of the product they aim to develop. Amada Miyachi Europe evaluates whether the proposed joint is suitable, and gets involved with the design process to ensure quality down the line. Then, the information from the customer is brought to the applications lab, which considers what bonding or welding equipment is necessary. In the case of a laser welding system, the applications engineer will determine what laser should be used. For ablation, an Ultra Violet laser might be installed for certain materials, whereas a fibre laser may be better suited to others. From there, the technology is built into modular system platform, with the customer involved throughout the design and build process. When the system is built, Amada Miyachi Europe invites the customer to put the machine through an extended trial to ensure it is performing to expectations. Finally, Amada Miyachi Europe engineers install the system at the customer’s site and train the customer. The result is not just a laser system or Hot Bar system - it is a solution with specific value to a customer, and the end user. Device manufacturers have many welding and bonding technologies to choose from when engineering their manufacturing processes. Some technologies are best applied to Class III devices, and others offer more to wearables and other non-invasive technology. In every case, it is beneficial to understand the benefits and drawbacks of technologies that perform similar functions when making a decision. Amada Miyachi Europe offers its expertise to all manufacturers and correctly matches any welding, soldering, bonding, brazing, laser micromachining and laser marking application with the most suitable platform for their needs, customizing any of them as required to the specific production demands of the manufacturer.